"Just wanted to say thank you for this awesome product and that you had the courage to make it a freebie! My hat goes off to you. Thank you so very much; those are very useful tools and greatly appreciated." 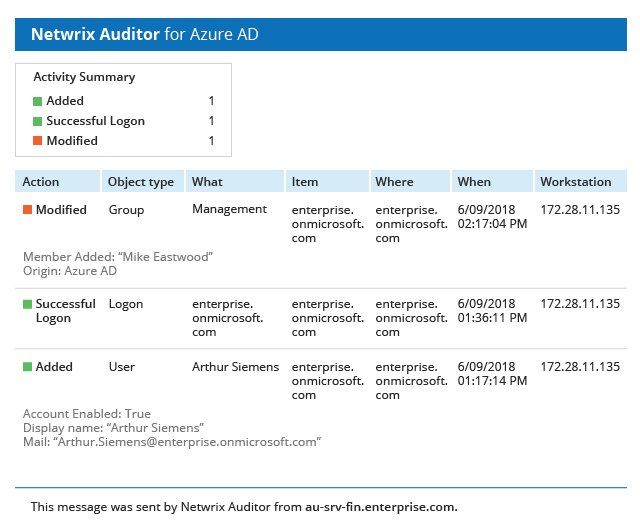 The free edition of Netwrix Auditor for Azure AD provides visibility into all changes and logons in your cloud directory. Daily activity summaries provided by this Azure security monitoring tool deliver the necessary details about every event during the last 24 hours, including the before and after values for changes, so you can detect and remediate modifications that threaten application uptime and respond to security incidents faster to ensure your cloud security. Reports on successful and failed attempts to log on to Azure AD and cloud applications. Also shows what AD objects were added, modified or removed, with the current and past values. Slashes the time spent in Azure Security Center and analyzing native audit data by sending daily email reports on all changes and logons. Relieves you from extra expenses on Microsoft Azure security monitoring, and will never expire or stop working when you need it. Delivers actionable data about changes and logons, making it easier to spot unwanted activity and respond to it. Lack of visibility into Azure AD increases your vulnerability to multiple security threats. Netwrix Auditor’s security intelligence overcomes the drawbacks of native logs, providing clear, noise-free audit data to help you monitor your Azure environment and spot critical issues and suspicious activity, such as user account changes, repeated failed sign-ins and deletions of Azure resources, so you can improve security management of your cloud services. Azure AD holds the keys to many of your organization’s critical assets, so you need to establish full control over it. Lack of regular monitoring can lead to system downtime that disrupts essential business processes. This free tool offers comprehensive auditing capabilities so you can discover inappropriate or malicious actions that could threaten your cloud infrastructure, giving you a level of visibility that legacy solutions simply can’t provide. "Netwrix Auditor is a fantastic product and its price doesn’t have an effect on my budget. We use it for security and compliance purposes. We chose it based on recommendations and wonderful reviews, and are very happy with it. It helps us save a lot of time — up to 2 weeks of our workload during some audits." The free edition of Netwrix Auditor for Azure AD is quick to download, and the step-by-step configuration process is so clear that you won’t need a manual. Here are the minimum system requirements.